Bonjour lecteurs! 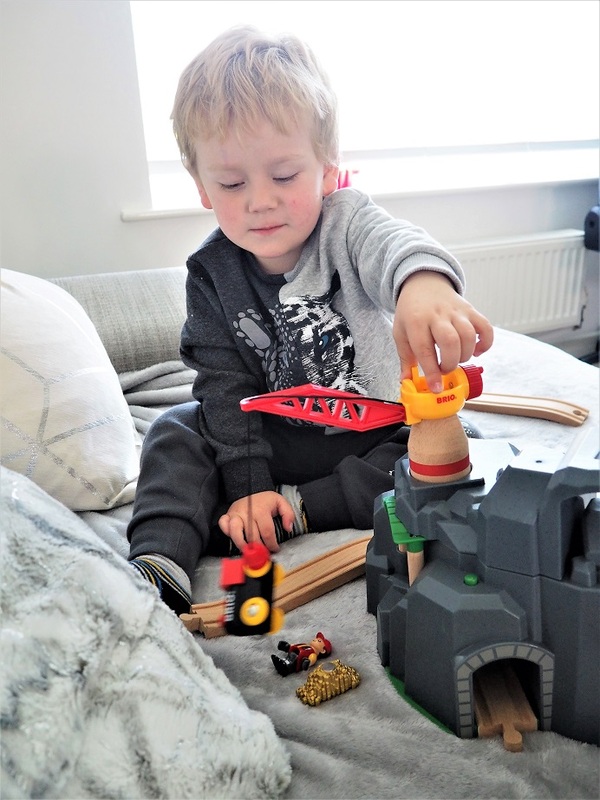 Are your little ones fans of trains? And if they also love the world of BRIO like us, you might want to check out its Crane and Mountain Tunnel. We just added up this to our wooden toys collection and Baba played for hours with it! Like many of the brand’s toys, it is well thought for beaucoup de fun! But let’s tell you all the details in our very Frenchie BRIO Crane and Mountain Tunnel Review! This new addition to our BRIO collection is a lovely creation. With its multistorey railway passage and the big crane at the top, it looks like a great piece to add to any train set! Have fun lifting the crane at the top of the mountain and you might find some gold! Once you insert the 2 AA batteries, you can hear some sound. It is so fab for your little ones as it makes a very realistic noise once the vehicle passes through the tunnel! Once the BRIO Crane and Mountain Tunnel arrived in our house, Baba was eager to take it out and play with it straight away! He could not believe it was his! Like any other toys from the range, it was very simple to assemble. The Mountain Tunnel in itself was only divided into 2 parts so it was not compliqué! Once it was all done, the whole thing looked very majestuous! Plus the little character included is also very sweet! Not too small either, you have no risk of your little one swallowing it. So you can be safe that your they have fun! Even if the big thing about this toy is the train sound, Baba was more than happy to do it itself. So it is really up to you if you actually want to put some batteries in. Bien sûr, it makes it more interactive but as always with BRIO, it is up to you and we like l’idée to be entertained in any way you want to! But what Baba really liked was the magnet in the crane. He was very intrigued by the magnetism and I must admit that he tested it with some of his cars to see how it worked! So we got more than some gold in the end! The magnet was the big hit for us! Once more, BRIO creates some beautiful toy to make children learn and discover the world while having fun! It is way more than building a beautiful world! 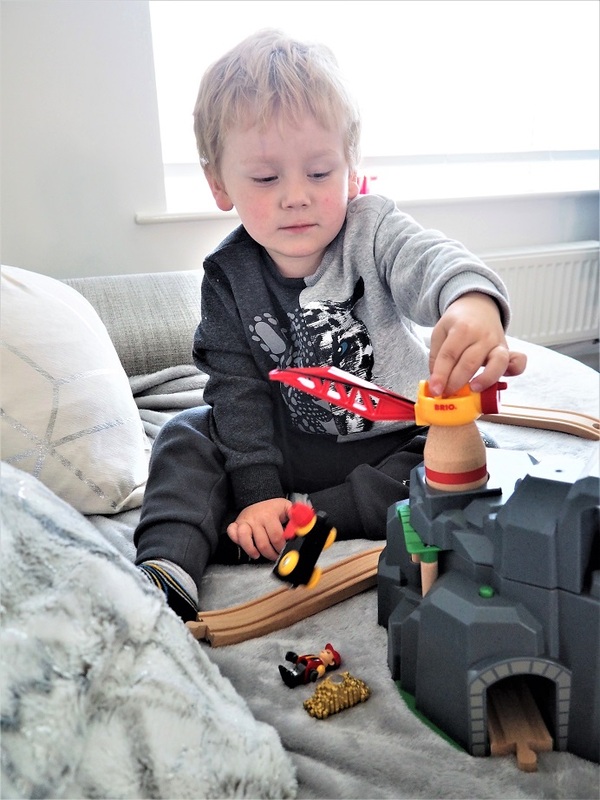 Even if the BRIO Crane and Mountain Tunnel was created to work well with any train set you already have, it did not stop Baba having fun with it without any extra tracks! But he made the link and as soon as he had it, he was fast to go to his bedroom to get his trains! 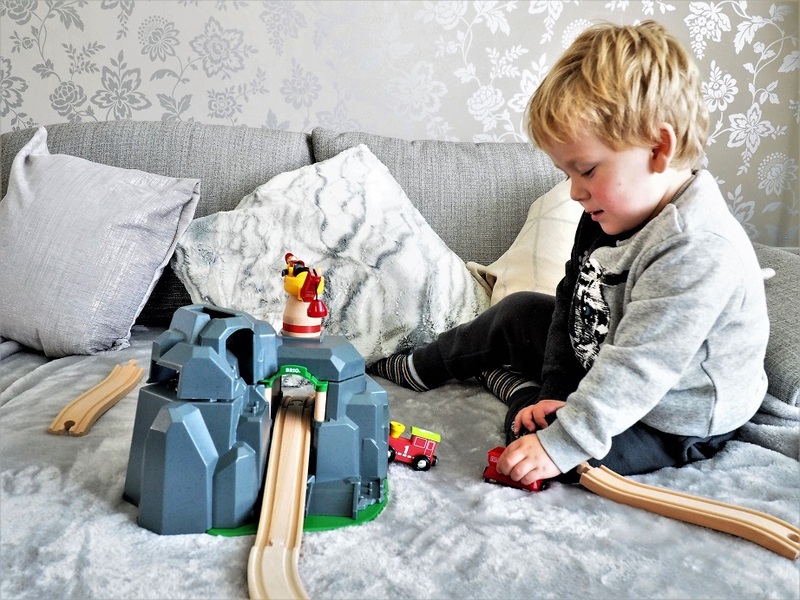 The BRIO Crane and Mountain Tunnel is a beautiful piece that allows so many possibilités when it is time to play! We loved the fact there are so few pieces so that you can build it encore et encore in seconds! Conceived to add some fun to any train set you already have, you can also enjoy it on its own. But of course, if you want the total look, then you need to add up some BRIO tracks! It’s solid and fun with four different sounds that can be activated when the train passes through the tunnel. Priced at £49.99, it might seem un peu expensive but what a stunning addition to any BRIO collection! It would make a nice treat for Christmas! 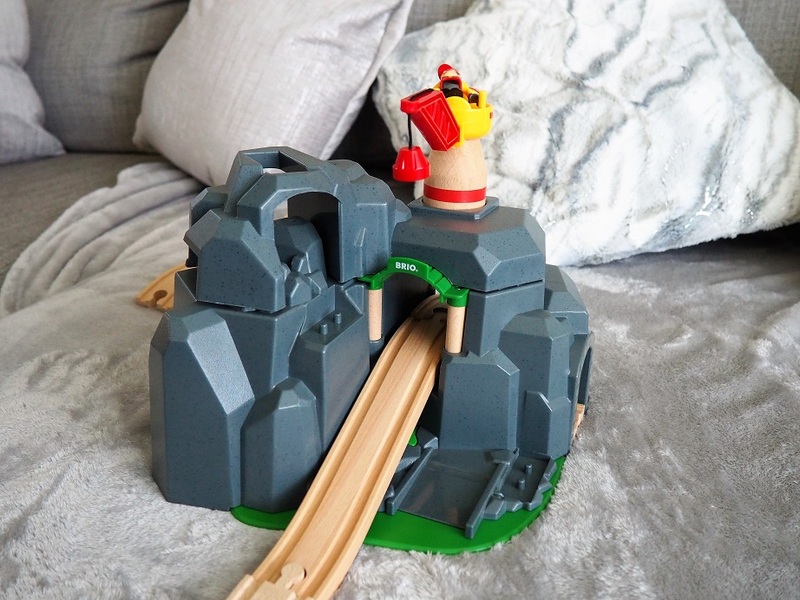 Thanks for reading our BRIO Crane and Mountain Tunnel Review. It is another fab item in our collection. Disclosure: We received for free a BRIO Crane and Mountain Tunnel in exchange for an honest opinion. I love Brio, they last for years and are great for little hands. I like that there is a magnet in the crane, a subtle introduction to physics. 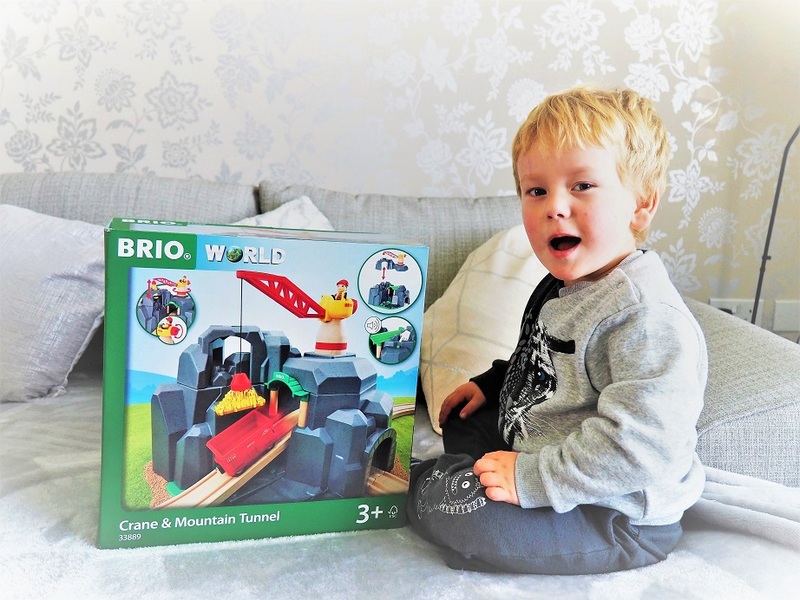 I love Brio – great brand and beautifully made. My boy Charlie is a huge car, truck,train,plane fan he’s a proper boy and loves everything that goes fast ? Brio is so fantastic, and even better with the addition of mountain tunnels and a crane. Makes for lots more adventurers. What a lovely toy! I love wooden toys for children, they are classic and timeless. My little boy loves trains and tracks too! This looks like it would be great fun for my youngest grandson! Fantastic fun, it looks like Baba is having loads of fun with this.